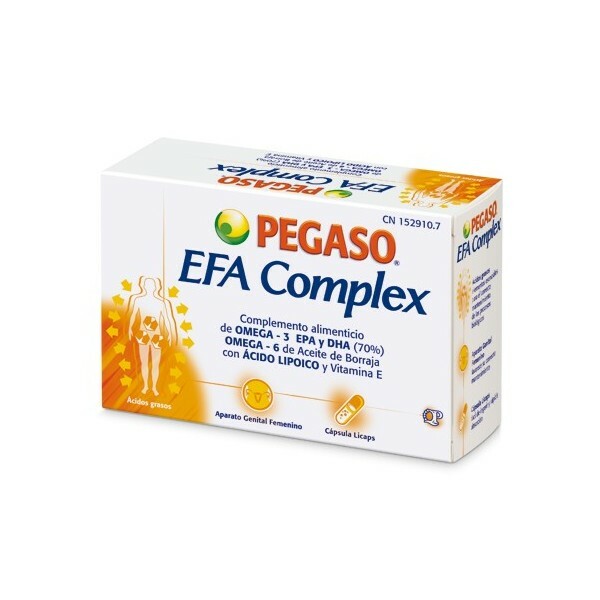 Pegaso Efa Complex 40 capsules. 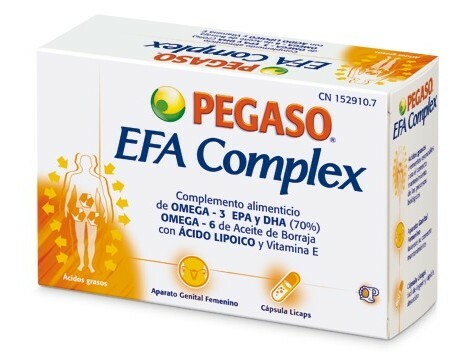 EFA Complex is the first dietary supplement of omega 3 overall antioxidant action. It comes in liquid capsules "Licaps" with total transparency patented seal. Contains a minimum of excipients, it is easy to swallow and dissolves and absorbs quickly. Essential supplement during pregnancy and lactation. It is recommended in deficiency states of polyunsaturated fatty acids. Food supplement capable of providing an additional amount of Omega-3 fatty acids, EPA and DHA and Omega-6 from Borage Oil, Lipoic acid and vitamin E. Polyunsaturated fatty acids present in EFA Complex has been obtained from fish oil by molecular distillation process. Contribute to the optimal contribution of these nutrients essential for the proper functioning of the body. EFA provides Natural Vitamin E Complex 100% RDA and alpha-lipoic acid and antioxidants. Easy to digest Quick solubility and absorption Useful for Deficiency states of omega 3 and omega 6 Neuronal development and visual system of the fetus during pregnancy Increased absorption of calcium and fat-soluble vitamins for the child during breastfeeding Composition: Entitled Borage Oil (GLA 20%), fish oil rich in EPA and DHA (70%), edible gelatine, vegetable oil, alpha-lipoic acid, d-alpha-tocopherol (vitamin E). The possible change in color of the capsules does not alter the quality and conformity of the product. -------------------------------------------------- ------------------------------ How to use: Adults: 1 capsule 2 times daily before meals. Do not exceed recommended dose.